These two ideas are far in advance of anything Ofcom has yet come-up with. Ofcom have been hanging onto an outmoded notion of “a national approach” in regulating BT that has taken no account of the fact that the country has two quite different market structures. Half the country has “access wire” competition from Virgin and the other half is largely a BT copper wire monopoly. Ofcom has been applying a single policy that has been falling between two stools. It has not heated-up the competition between BT and Virgin media to stimulate them to drive out full fibre in the urban parts of the UK. On the other hand, it has not created the price headroom to attract private capital to aggressively invest in fibre where BT has its access wire monopoly. There has been some good stuff from Alt Nets with government support but it has been limited in scale. The geographically differentiated approach can accelerate the pace of these alternative networks as well as giving BT more incentive to invest. It makes a lot of sense in the circumstances where the Treasury will not have the money for a grandiose tax payer funded full-fibre national roll-out. The second “big idea” is to leave the four mobile operator model as it is (whilst not being fixated on there being four) and looking for ways of encouraging neutral hosting, smaller players and self-help approaches to stretch 5G coverage and fill-in the likely gaps. The critical input to make this work successfully is access to 5G spectrum at an affordable price. The government suggests spectrum sharing in the 5G pioneer sub-band 3.6-3.8 GHz and allowing opportunistic access to the vast amount of wasted spectrum outside of city areas that Ofcom’s orthodox approach generates. Conceptually, it comes together very neatly with the fibre outside-in strategy, as adding “a local 5G mobility” component enhances the consumer proposition. It has all the attributes of being “a winner” for rural Britain when 5G equipment prices fall sufficiently. 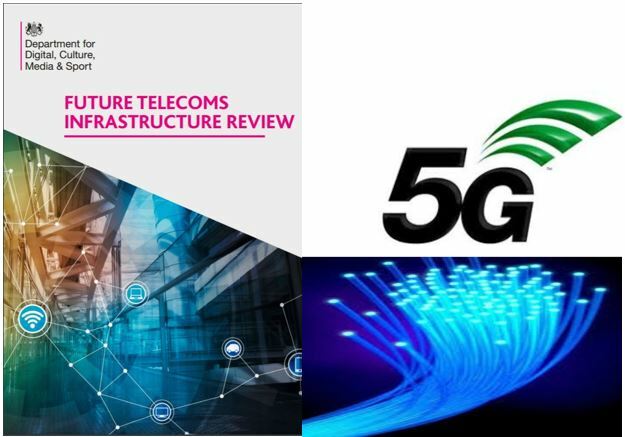 Two other noteworthy features of the report are the provision of some national targets and the government getting stuck into removing all the boring detailed barriers to the roll out of full fibre and 5G. There are no glamorous headlines for politicians in sorting out these detailed barriers but this is precisely where cost can be taken out. Having quantified national targets also creates focus on what needs to be done and when in order to get there. Ultimately, a report should be judged by whether it “moves the needle” for the country and this report has enough in it to do just that. This is some achievement in a political environment of near paralysis from Brexit. In that challenging context, the report has delivered the optimal point of balance of technical ideals, market forces and political realities. You are currently reading "Government’s Future Telecommunications Infrastructure Review"